Disclosure: As an Amazon Associate I earn from qualifying purchases. There are some affiliate links below, but these are all products I highly recommend. I won’t put anything on this page that I haven’t verified and/or personally used. Please read my disclosure to learn more. prepared turkey — depends on the selection and your preferences of dark or white meat. I chose a boneless turkey breast roast with the skin on. make your life even easier by ordering your groceries through Instacart. Use the code: RLAMBERTF4333 to get $10 off your first order . In a medium pot, gently simmer cranberries, orange juice, and sugar until most of the cranberries have popped. Cranberry sauce is not something I recommend buying pre-made. That said, it’s super simple to make and it’s the only thing in this post made from scratch. You can make this the day before. I use it in the brie appetizer and to serve with turkey. Start with pre-made puff pastry from the freezer section and slice into 3-inch squares. Cut brie into 1-inch cubes and place pastry and brie into muffin cups. Add a spoon of cranberry sauce and a pinch of chopped pecans. Pinch the corners of the dough together but don’t worry if there are gaps. Bake at 350 degrees for 25 minutes or until puff pastry is puffy and golden. Start with pre-made butternut squash bisque. Add a diced apple and gently simmer for 10 minutes. Garnish with some chopped fresh sage and pumpkin seeds. Start with a boneless turkey breast roast. Bake per instructions. When it has 30 more minutes to bake, brush with melted butter, maple syrup, and fresh cracked pepper over the skin to make it crispy. Slice and serve over a bed of fresh sage if you’re fancy. For the gravy: Start with pre-made turkey gravy. Warm in a sauce pan. Add the drippings from the turkey pan and a tablespoon of apple cider vinegar, if you have it. P.S. If you own a gravy boat you are in danger of violating the rule of threes. Gravy served in a measuring cup tastes just as good! Start with pre-cut crouton bread. Combine with sliced shitake mushrooms, diced celery, diced onion, chopped parsley, and craisins. I like my portions to be half bread and vegetables. Drizzle with olive oil, salt and pepper. Bake covered for 30 minutes at 350 degrees (or whatever the turkey calls for). Uncover and continue baking for an additional 30 minutes to crisp the top. Start with pre-made mashed potatoes from the Whole Foods hot bar. Warm in a pot with butter, sour cream, and fresh dill. I understand there is a biased against store-bought mashed potatoes, but do you really think the magic is in the peeling and the boiling? Start with roasted sweet potatoes from the Whole Foods hot bar. In a small pan, melt butter and brown sugar. Stir in the pecans and pour the mixture over the sweet potatoes. I consolidated and warmed the mashed potatoes and sweet potatoes in the same dish! 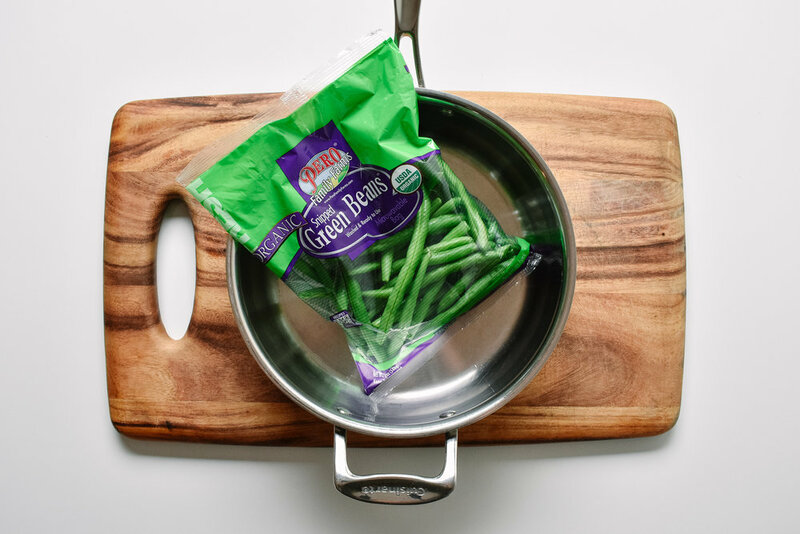 Start with pre-washed and trimmed green beans. Steam for a few minutes and toss in some sliced almonds. 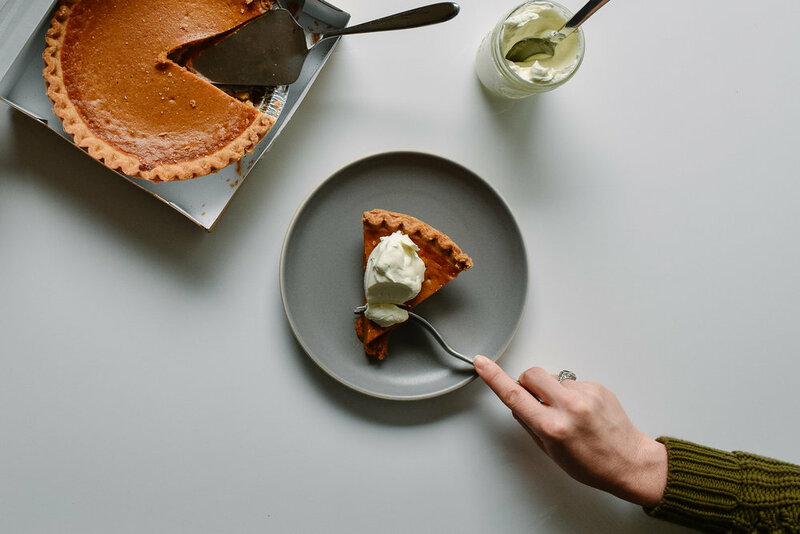 Start with pre-made pumpkin pie. Make homemade whipped cream sweetened with maple syrup to taste. 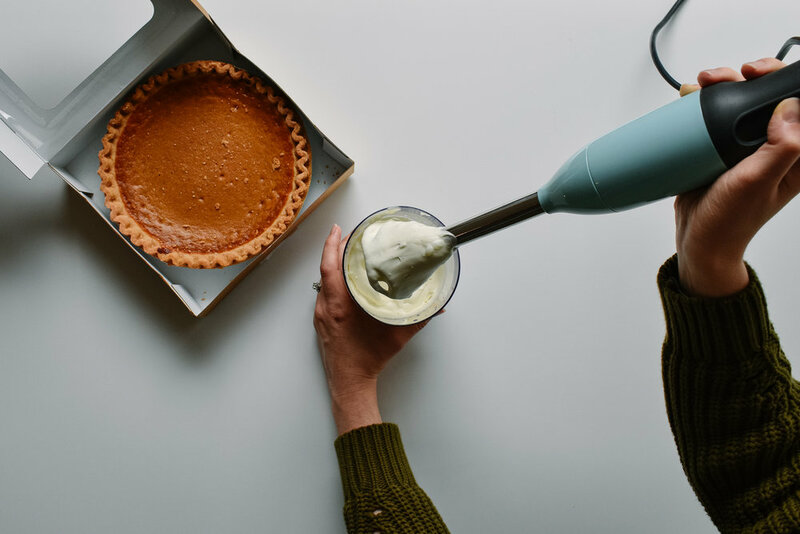 I use my KitchenAid immersion blender (I have very few kitchen gadgets but this one I can’t live without). Whipped cream is also easy to make by hand: just vigorously whisk cold heavy cream in a cold metal bowl (make everyone take turns!) until it’s thick enough to create little mountain peaks. 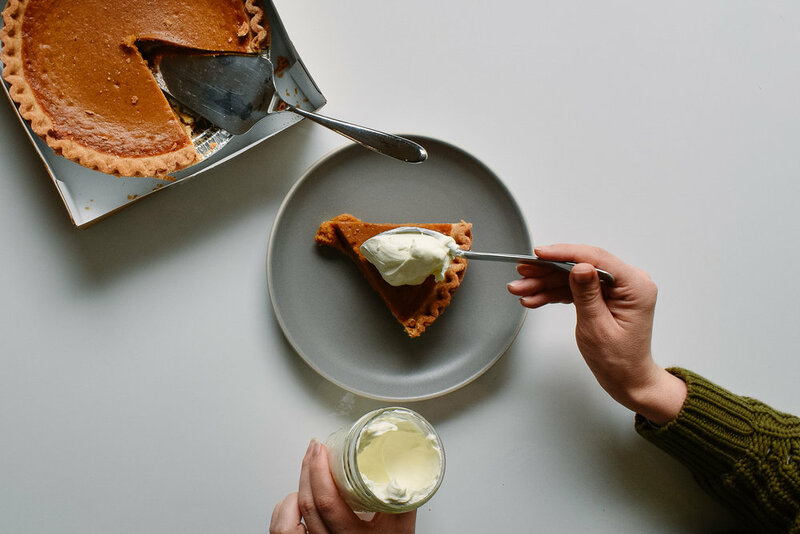 Serve the pie with a dollop of whipped cream and then lick the bowl so you don’t have to wash it. Turns out the life of a blogger happens one month in advance so I already celebrated Thanksgiving. Really I was just perfecting how to make a full Thanksgiving meal in a tiny kitchen so you don’t have to! On the actual turkey day, I plan on ordering Chinese food and playing board games. Special thanks to Adam Gong for capturing our Thanksgiving!